The polls for the 2019 Israeli elections closed on Wednesday evening with a very close finish between the two main candidates for Prime Minister, Binyamin Netanyahu and Benny Gantz. Late Wednesday night, Gantz conceded to Netanyahu – although now the Likud bloc led by Netanyahu must form a government before a full victory is declares. The Right Wing alliances won the Israeli Knesset (Parliament) with 65 mandates. At the final tally, the current Prime Minister Benjamin Netanyahu (Likud Party) was ahead with only fifteen thousand votes ahead of Benny Gantz (Blue and White Party). In the weeks leading up to Election Day, PM Netanyahu was accused of criminal charges including abuse of power as Minister of Communication, fraud, corruption, controlling telecom shareholders and conspiring for favoritism with newspaper publisher Arnon Mozes. Indictments should begin in the next few months, but it is possible that if re-elected, PM Netanyahu will pass a law to protect himself while in office. 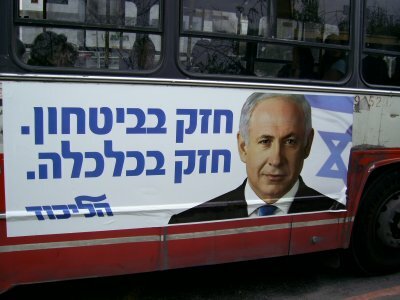 Benny Gantz’s party, Blue and White was established three months ago with “anyone but Bibi [the nickname for Binyamin Netanyahu] in 2019” as their main message. The Blue and White Party claims to offer a voice for right-leaning centrist and leftist moderates, but is headed by three former Israeli military commanders-in-chief. The two major parties (Blue & White and Likud) have both been accused of manipulating the minor alliances and absorbing their votes. Israeli analysts have pointed out that this dynamic is especially problematic, given that both of the major parties are right wing, and neglect a large segment of the population (immigrants, Palestinians with Israeli citizenship, peace advocates on the left, and post-military young adults). PM Netanyahu has been in office for ten consecutive years. With this win, he will become the longest serving Prime Minister in Israel’s history, other than the country’s first PM, Ben Gurion.